With bolt, nut and washer. Pack loose. National Hardware Door Pull, Extra Heavy, Series: V6, Suitable For Use With: Metal and Wood Doors, 6-3/4 in Length, 1.38 in Width, 1.82 in Depth, Steel, Zinc Plated Used to reinforce doorways against forced entry by providing secure placement of 2x4 lumber against entry side of door. 2x4 must be slid through the bar holders. Clearance for 1/4" bolts. Manufactured from hot rolled steel. Used to reinforce doorways against forced entry by providing secure placement of 2x4 lumber against entry side of door. 2x4 must be slid through the bar holders. Clearance for 1/4" bolts. Manufactured from hot rolled steel. Used to reinforce doorways against forced entry by providing secure placement of 2x4 lumber against entry side of door. 2x4 must be slid through the bar holders. Clearance for 1/4" bolts. Manufactured from hot rolled steel. Designed as a support bracket for Stanley's 105270, 105676, 105213, and 105726 box rail at 24" OC intervals. Includes lags. Display packed. National Hardware Door Pull, Extra Heavy, Series: V6, Suitable For Use With: Metal and Wood Doors, 6-3/4 in Length, 1.38 in Width, 1.82 in Depth, Steel, Black Used to reinforce doorways against forced entry by providing secure placement of 2x4 lumber against entry side of door. 2x4 must be slid through the bar holders. Clearance for 1/4" bolts. Manufactured from hot rolled steel. Designed to support double run of #5114 or #5116 box rail. Suitable for use on corrugated metal siding due to narrow surface. Does not come with rail bracket or fasteners. Can be used as double stop when used with #6008 door stop. 300 lb. safe working load. 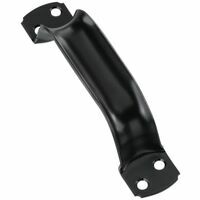 Designed for use as a door stop on up to 2" thick sliding doors. Embossed steel for added strength. Display packed. National Hardware Door Pull, Series: V6, Extra Heavy, Suitable For Use With: Metal or Wood Doors, 0.29 in Diameter, 6-3/4 in Length, 1.38 in Width, 1.82 in Depth, 0.1 in Plate, Steel, Galvanized, Standards: BHMA A138.18 Designed to join two pieces of Stanley's 105270, 105676, 105213, and 105726 box rail. Meets ANSI/BHMA A 156.14. Includes lags. National Hardware Door Pull, Extra Heavy, Series: V6, Suitable For Use With: Metal and Wood Doors, 6-3/4 in Length, 1.38 in Width, 1.82 in Depth, Steel, White, Vinyl Coated Designed to be used with #5400 round rail to join and hold two lengths of rail together. Includes lag bolt and spice screws. Splice screws are inserted in holes at the end of round rail. Safe working load 300 lbs. Designed to join #5114 or #5116 box rail. Brackets can be installed on a 2 x 6 header board. Offset nail holes for quick placement. Compatible with 5438 & 5439 snap-on flashing brackets. Includes lag bolt and spice screws. Splice screws are inserted in holes at the end of rail. One splice bracket should be installed on every length of rail to lock it in place. Pack loose. Without screws. Each loose. Designed for use as a heavy-duty guide on large, sliding doors up to 3-3/4" thick. Slots in frame provide adjustment for holding doors against wood walls or posts. Delrin wheel is reversible; it can be used either side of frame. Offers sturdy steel frame construction. Meets ANSI/BHMA A 156.14. Roller is adjustable. Includes nail and lag screw holes. Hardened steel bolt for greater strength. Display packed Designed for mounting #5114 or #5116 box rail. Includes 2 lag bolts, carriage bolt and nut. BHMA A138.18. Suitable for use on corrugated metal siding due to narrow mounting surface on sliding door systems. Adjustable to bring rail closer or further away from building. 300 lb safe working load. 7.12"L x 3.25"W x 2"D. Can be used with flashing with the 5151 flashing bracket. 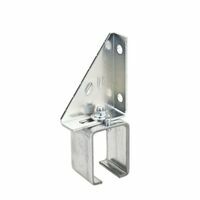 Designed to engage the bottom of a single TAB-LOC door in either the open or closed position to hold firm against the building. For bi-parting doors stop engages in the open position only, also used on wood frame doors using #6061 or #6062 continuous bottom guides. Slotted holes in each leg allow both lateral and vertical adjustments. Bolt, nut, and washer are included for easy attachment. Boxed. Packed With Wheel Trucks Only. Durable one piece, precision formed steel. Comes with self-lubricating Deirin Bearings. Suitable for use with No 59, 5100, 5103, 5104, 5105, 5110, 5114 or 5116 box rail. 225 lb/hanger safe working load, 2.14" diameter. 4.15"L x 3"W x 1.61"D. Standards: BHMA A138.18 specified. Extra-wide guides are designed for corrugated metal-clad doors, can be used as a door stop when mounted sideways. Curved section of guide may be turned sideways allowing straight access when installing screws. Fasteners are not included. Guides have holes for spikes as well as larger holes for 3/8" lag screw mounting. Guide is adjustable for doors up to 5-1/2" thick. Boxed Designed to hold wood and metal doors firmly in place against the door jamb on farm and utility buildings. It also can be used for end gates on stake trucks. Offers 7" hook. Designed for right- or left-hand applications. 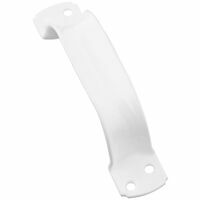 Pre-punched, reversible strike plate for use on 1-1/2" or 3-1/2" thick door frames. Boxed. Designed to press into rail to keep rail free of foreign materials from birds or weather . Can be used as center stop using 3/8" x 2" carriage bolts (not furnished). Often packed with box hangers. 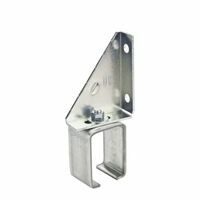 Designed for mounting #5114 or #5116 box rail. Includes 2 lag bolts, carriage bolt and nut. BHMA A138.18. Suitable for use on corrugated metal siding due to narrow mounting surface on sliding door systems. Adjustable to bring rail closer or further away from building. 300 lb safe working load. 7.12"L x 3.25"W x 2"D. Can be used with flashing with the 5151 flashing bracket. One splice bracket should be installed on every length of rail to lock it in place. 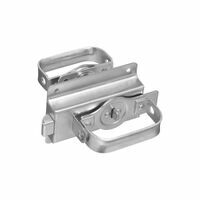 National Center Latch, Heavy Duty, 10.63 in Overall Length, 8.13 in Overall Width, 5.88 in Overall Depth, Zinc Plated Designed to engage the bottom lateral of TAB-LOC doors to hold door firmly in place and prevent wind damage to both the door and building. Fastens to building using #6005 Guide Rail Brackets. Also used with #6061 or #6062 continuous bottom guides. Includes pre-punched mounting holes to attach #6005 guide rail brackets. Pack loose. Designed for bi-parting wood sliding doors at least 1-1/2" thick. Cam action and adjustable hook holds doors tightly together. 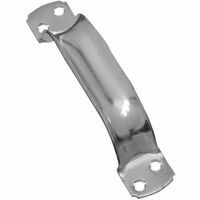 Pre-punched, reversible strike plate for use on 1-1/2" or 3-1/2" thick door frames. 15" long hook. Boxed. National Hardware Swinging Door Latch, Heavy Duty, Series: V25, Suitable For Use With: 3/4 - 2-1/4 in Thickness Doors, Fasteners: Screws, Steel, Zinc Plated, BHMA A138.18 Designed to be used with #5400 round rail to mount double runs of rail for by-passing doors to side of building installation. Includes lag bolt, two carriage bolts and two nuts. (1) Bracket should be installed every 2 feet of rail. Suitable for use on corrugated metal siding due to narrow mounting surface.